Alberta Clippers are low pressure areas seen frequently in winter, although they can occur anytime from mid October to March. These are called “Clippers” as they are usually very fast moving and can follow one after another. They originate in the Alberta province of Canada and dive southeast into the central U.S. The upper level pattern required to produce these systems will have an upper level ridge of warm air aloft over the northeast Pacific and far western North America and a low pressure trough and cold air aloft over the central and eastern U.S. This produces a strong jet stream flowing south and southeast into the U.S, and is called a northwest flow. Exactly how far east or west the upper level ridges and troughs are located determines the track of the clippers descending into the U.S. 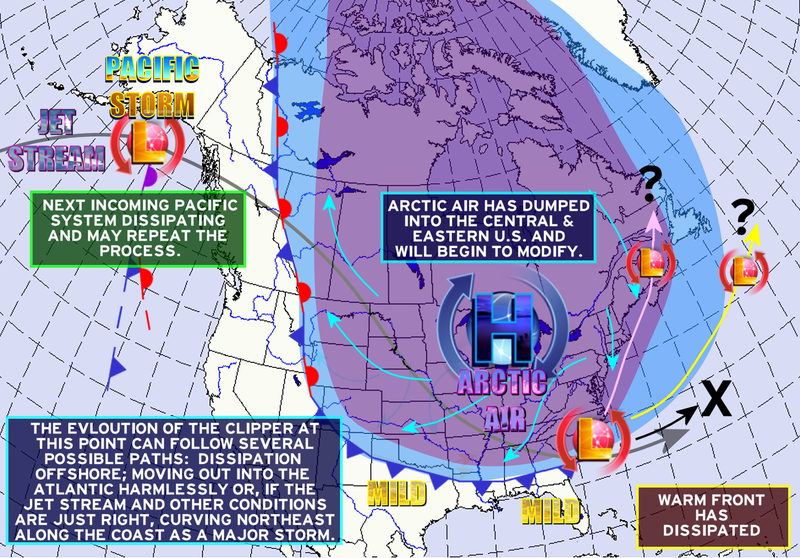 If these features are further west, more of the country is impacted by the clippers, or if further east, the clipper’s influence may be limited to the Great Lakes and Northeast. The northwest flow is often the result of a strong positive Pacific North American (+PNA) weather pattern. This is a simplified classic depiction of a Positive Pacific North American (+PNA) weather pattern and some general effects. This is just a generalized description as each pattern’s configuration will be different. With a ridge of mid and upper level high pressure over the eastern north Pacific and western North America and a trough of low pressure over the central and eastern U.S., northwest flow is in place over the Midwest and Plains. Incoming Pacific storms are carried northeast toward Alaska with the trailing front dissipating to the south. Westerly cross-barrier flow (over the Canadian Rockies) begins to develop a lee trough on the high Plains of Alberta. 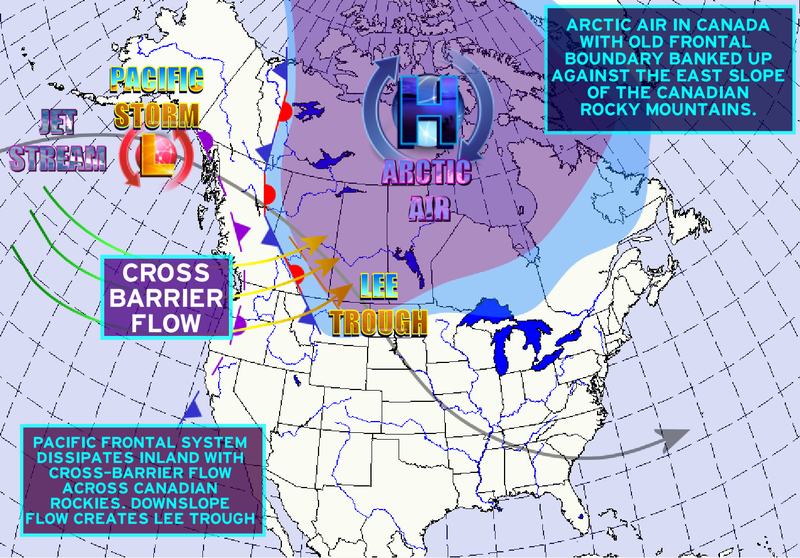 This is a cross section of the air cresting the Canadian Rockies and moving downslope into the high plains of Alberta. Downslope flow begins to warm the air near the eastern slopes (greenish-blue area), with an area of spinning air forming along the low pressure trough on the Alberta Plains. The Pacific storm and frontal system weakens and dissipates over the high terrain of the Rockies. The cross-barrier westerly flow continues and a low pressure area forms where the “spin” began in Alberta. Ongoing downslope flow spreads southward into the U.S., with continued warming of the air mass against the eastern slope of the Rockies. This causes the low pressure trough (lee trough) to transition to a warm front. The new low pressure area forces Arctic air to its north to the west, which will cause the old frontal boundary to strengthen and become a cold front. This is a cross section of the atmosphere showing the development of the clipper low from the spinning air over the high plains of Alberta. The Clipper begins to move south into the U.S.
Northwest flow aloft carries the new storm system into the U.S. A now well-defined warm front swings out into the Plains, with very warm and dry air, heated and dried by the downslope flow, causing windy and warm weather to the south of the clipper low. 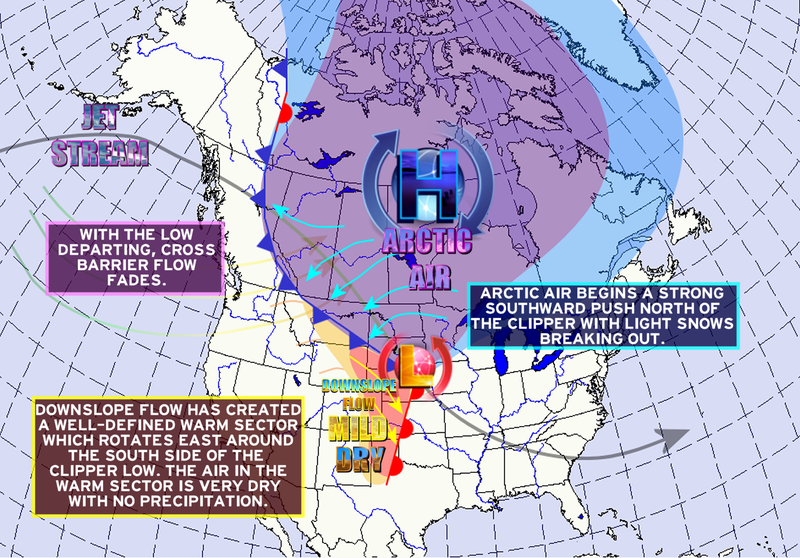 To the north, Arctic air is flowing southward into the northern Plains. Left over Pacific moisture is squeezed out in the cold air causing light snows or light rain to develop along and north of the low pressure area’s path. As the Alberta Clipper exits the Midwest. cold air floods southward into the center of the country, depending upon the position of the jet stream. The warm and dry air mass south of the clipper low begins to modify, pick up a bit of moisture and cool off as it moves away from the Rockies and the downslope effect fades. Light rains and snows continue to the north of the low, with heavier lake effect lows possible if the Great Lakes are still open. Further north, the cold front becomes banked up against the Rockies, unable to push west. The clipper reaches the end of the line — or does it? As the clipper low reaches the coast, it can have several different outcomes. The low can dissipate offshore, track out to sea, or if jet stream conditions are right, can head up the coast as a major coastal storm. To the west, another Pacific storm approaches, ready to begin the process again. The clipper lows can follow almost one after another, with as little as a day between them; but for clarity, they have been shown much wider spaced here. Alberta Clippers can follow right behind one and other with repeated light snows to the north and large day-to-day temperature swings to the south of the low’s path. The northwest flow is often the result of a strong positive Pacific North American (+PNA) weather pattern. This is a generic representation of weather at the surface common with a strong positive Pacific-North American (+PNA) pattern. 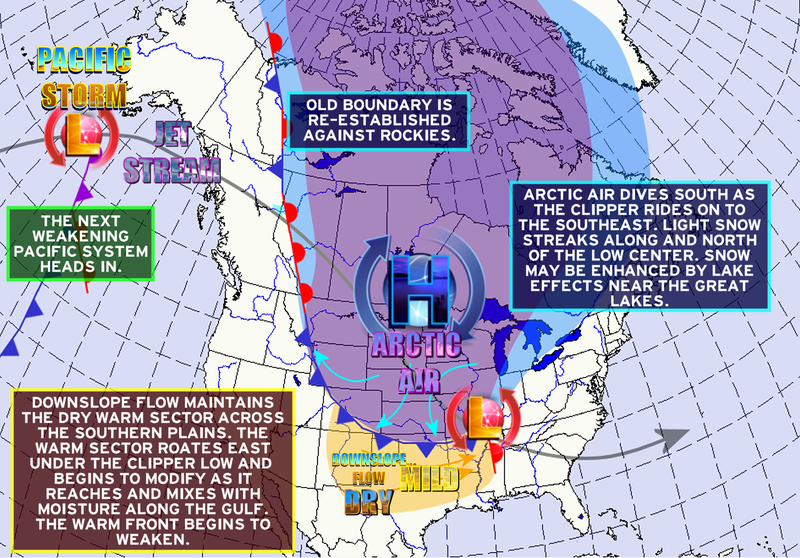 A deep trough in the central and eastern U.S. keeps a steady flow of cold high pressure areas dropping southward into the central and eastern U.S. The plains will see wider swings in temperatures as Arctic air alternates with warm and dry downslope flow, while areas further east remain consistently colder. This is a dry pattern overall, but there are exceptions. An active subtropical jet stream can undercut the western ridge and bring storm systems through the southern tier of states producing heavy snows for the Plains and Midwest occasionally. 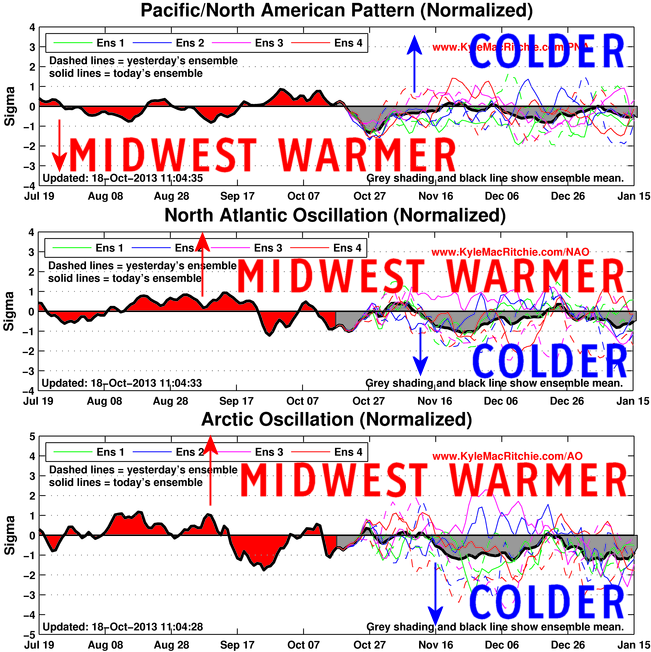 The patterns depicted here are just general representations, as each +PNA setup is different. Winter is a notoriously tough season to forecast. Long range climate forecasting and modeling still has a long way to go. Currently the best numerical weather prediction models exhibit around a 90% skill (accuracy) rate to 10 days and 80-90 rate at 16 days. Beyond that, accuracy simply becomes nothing more than random noise. Running these types of models out past these thresholds quickly devolves into chaos theory which is not useful for long range or seasonal weather forecasting. This is a big part of why any forecaster predicting a specific event such as a snowstorm or ice storm at a specific date three weeks a month or even two months in the future does so at their own peril. It is also why predicting several damaging ice storms or a specific number of snowstorms simply cannot be done. Pure chance or a roll of the of the dice has an equal opportunity of giving you an accurate number of winter snow or ice storms per any given winter season. Long range models such as the NWS Climate Forecast System’s Version 2 model, (CFSv2), the European Center for Medium Range Forecasting (ECMWF) model, the IRI and others shown here are not the same models used in forecasting near term weather. They operate on a different set of physics equations and programming. An added challenge in forecasting snowfall totals lies in the location of our region. Average annual snow ranges from as little as 6″ south to as much as 20″ north. These totals are well within the range of one or two powerful winter storms. A case in point was the winter of 2012-13. That winter was warmer than average and on the whole (three month period) not very snowy. 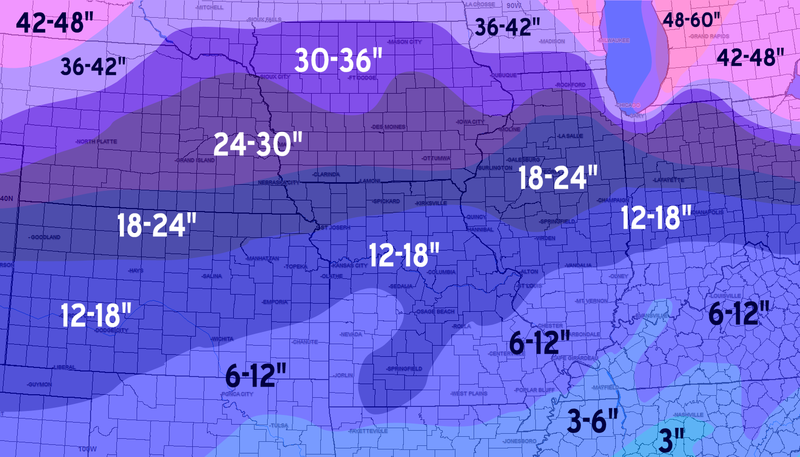 One late December snowstorm dumped an entire season’s worth of snow and then some over SE Missouri and S Illinois. That one storm, the only major storm, ensured those areas went down in the record books as a snowier than average winter. Kansas City and St. Louis fell victim to two to three major snows in February and March which dumped an entire season’s worth of snow and in the case of Kansas City, an entire season’s worth plus 10″. The point being that even with a warm and dry winter prediction, it can only take the right combination of factors to come together once or twice in that multi-month period to bring an entire year’s worth of snow. That’s not the same as for areas further north where average snowfall is 2 to 4 feet plus, well out of the range of almost all individual winter storms. Below is a graphic showing the average annual snowfall total for the greater Midwest based upon the 1981-2010 climate period. In this post, we will take a look at some of the factors we can look to for reliable clues for the winter ahead, and then take a look at several differing winter ideas. For cold air to develop, you need darkness, ice and snow. Darkness at the north pole is always a given in winter and nothing will change that, so we’ll look first to the extent of the ice cap heading into Winter. The chart below shows the extent of Arctic sea ice. After a record low in 2012, 2013 is running well ahead of that year, but still on the low side of average. 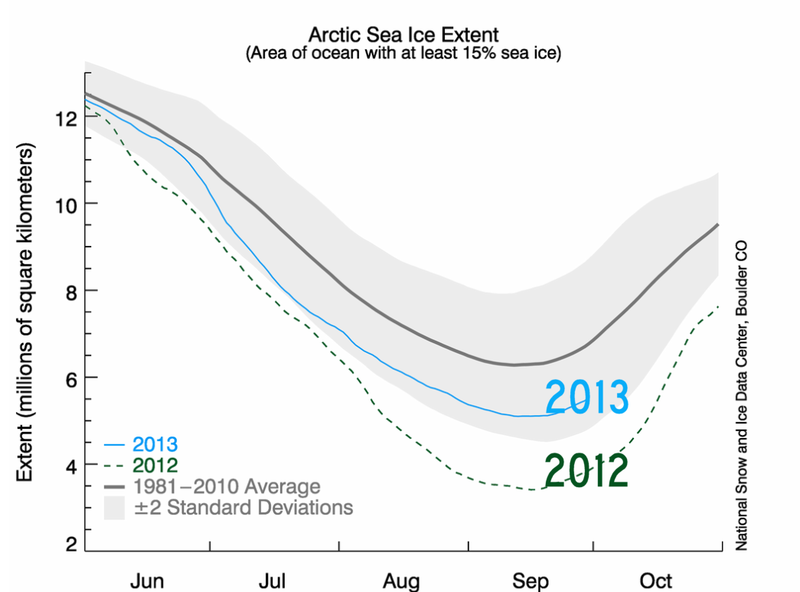 This graphic shows the extent of Arctic sea ice. The grey zone can be thought of as an average range while the grey line is the 30 year average. 2012 saw a record minimum sea ice extent while 2013 has had much more ice than 2012, within the average range but below the 30-year average. Once cold leaves the Arctic, in order to stay cold, it needs snow and ice on the ground. Otherwise it begins to modify or warm up as it heads south. The graphic below shows the mid October extent of snow and ice for this year as well as 2012, 2011 and 2010 for comparison. This will become more important later in the season; late November, December and January, but at least we can compare where we are starting from. 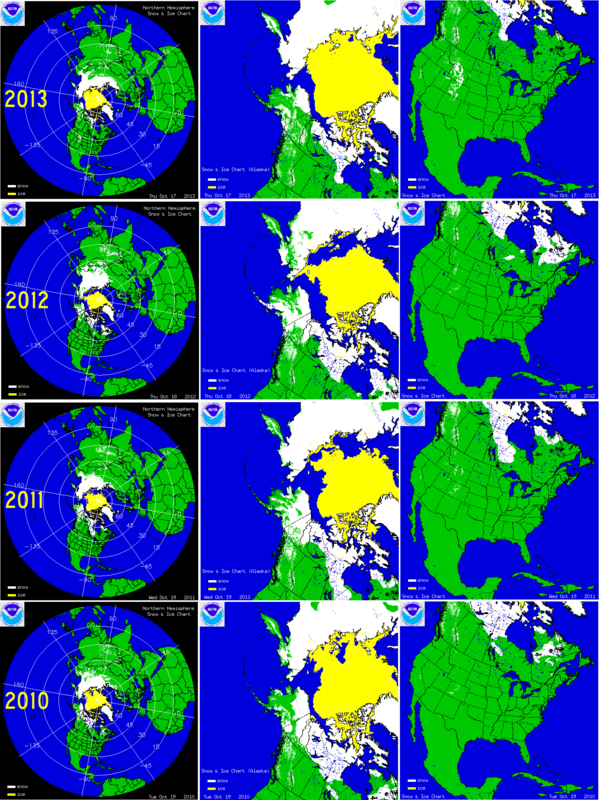 This graphic shows the mid October snow and ice cover from this year (2013) back through 2012 (before a mild winter early and cold and snowy winter late), 2011 (before a very warm and dry winter) and 2010 (before a cold and snowy winter). The amount of snow and ice over the high latitudes are important as they act to refrigerate the cold air building at this time of year in the Arctic. If there is a lack of snow and ice at high latitudes, the cold air warms as it heads south, lessening the intensity of the cold. One thing that is watched carefully is how far snow cover extends into the U.S. as even several hundred miles of bare ground can take the bite away from an Arctic air mass. These maps become more important later in the season as we move into December and January when the strongest Arctic outbreaks will occur, at this early remove it just gives us an idea of our starting point. Perhaps one of the most important factors outside of the cold and snow in the Arctic is the state of the ocean, and specifically how warm or cool it is and where those warm or cool areas are. The graphic below shows the sea surface temperature departure – or difference – from average in mid September of 2013, 2012 and 2011. 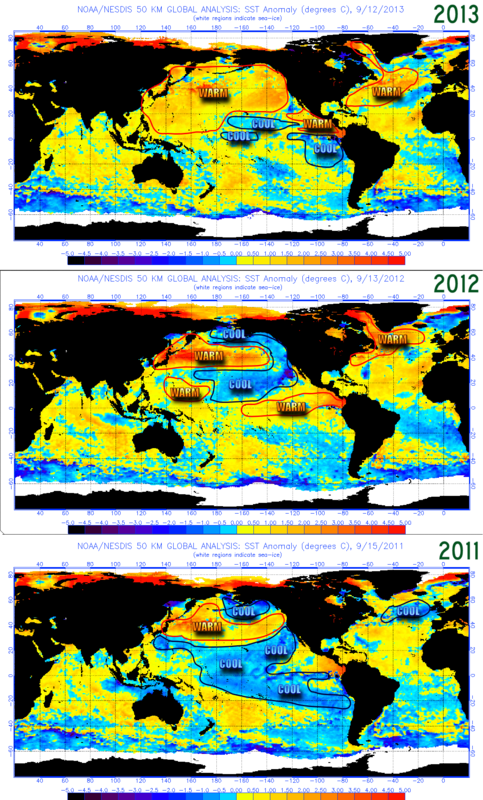 A quick glance shows how different the ocean temperature is this year from that in 2012 and 2011. 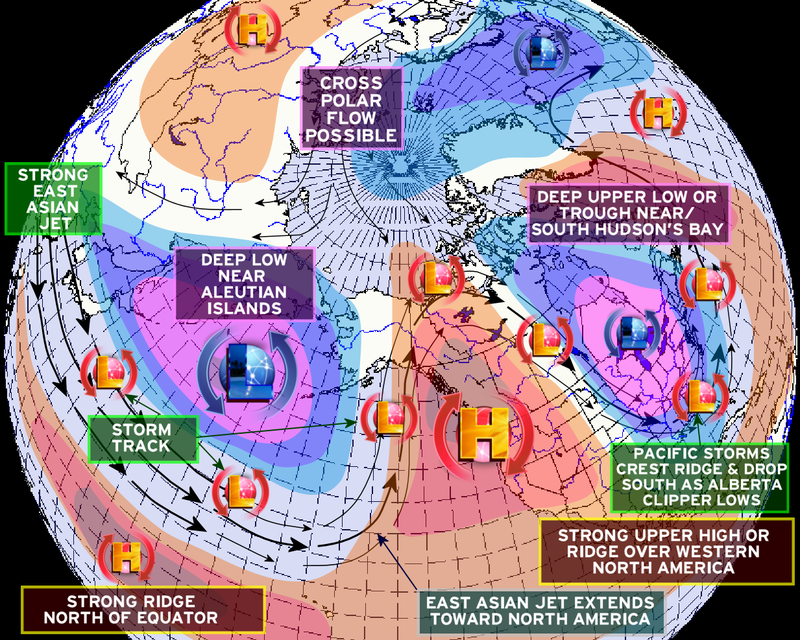 The location of the warm and cold pools is important as it plays into the strength and location of warm upper highs & ridges, as well as cold upper lows and troughs. Cold polar air contrasting with warm equatorial waters (El Nino) creates a strong temperature contrast which can create a stronger jet stream. That can result in a jet stream that remains strong and pulled back to the north, while cold polar air has less of a contrast with cooler equatorial waters (La Nina) for a weaker, and waiver jet stream. Another important factor in winter weather is the ocean. Covering 70% of the earth’s surface, it has one of the greatest influences on the weather. This graphic shows mid September sea surface temperature anomalies, which basically mean how warmer or colder the ocean’s surface is compared to average. When comparing 2011 to 2013, notice how the Pacific north and south of the equator is cool in 2011 and much warmer in 2013. The north Atlantic was cooler in 2011 and is warmer in 2013. Warm water favors blocking patterns in the jet stream. Warmth in the north Atlantic favors a Greenland Block, and warmth in the north Pacific favors a ridge in the eastern Pacific. Along the equator, the cool blue tones in 2011 represent a La Nina weather pattern, while there is no such organized pattern present in 2012 or in 2013. At this point an El Nino or La Nina is not expected this winter so they will not be the overriding drivers of the winter weather. Whether a warm or cool neutral trend develops and where it develops may be a contributing factor. 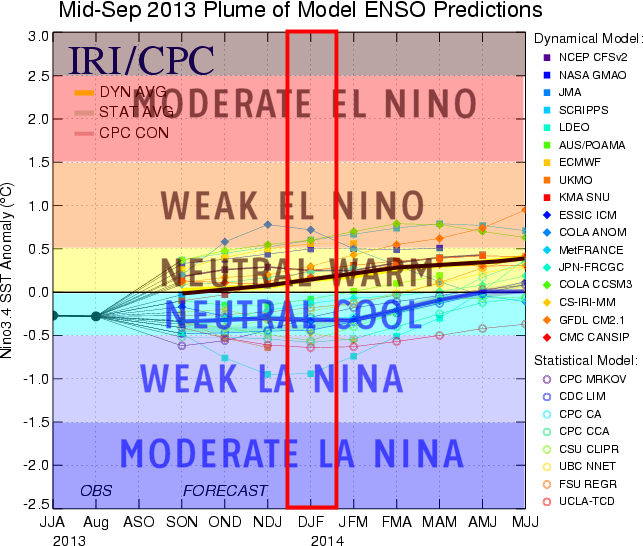 A major player in winter weather is always El Nino or La Nina. This year conditions are forecast to be neutral during the winter months (red box) One group of models favors neutral warm while another neutral cool. This means El Nino or La Nina are not expected to be a dominant factor in the winter forecast. As we have seen in winters past, the Atmospheric Oscillations (Arctic-AO, North Atlantic-NAO, Pacific North American-PNA) can play a really large role in the prevailing winter weather pattern. Note: These are notoriously hard to predict more than a few weeks ahead. In the past three winters, they’ve tended to remain stable for long periods each season. Atmospheric Oscillations (Arctic-AO, North Atlantic-NAO, Pacific North American-PNA) can play huge roles in prevailing weather. This graphic shows one computer model’s suggestion for these three oscillations. Note: These are notoriously hard to predict more than a few weeks ahead. In the past three winters, they’ve tended to remain stable for long periods each year. We have two essential votes for colder conditions(NAO/AO) and one vote for warmer (PNA). 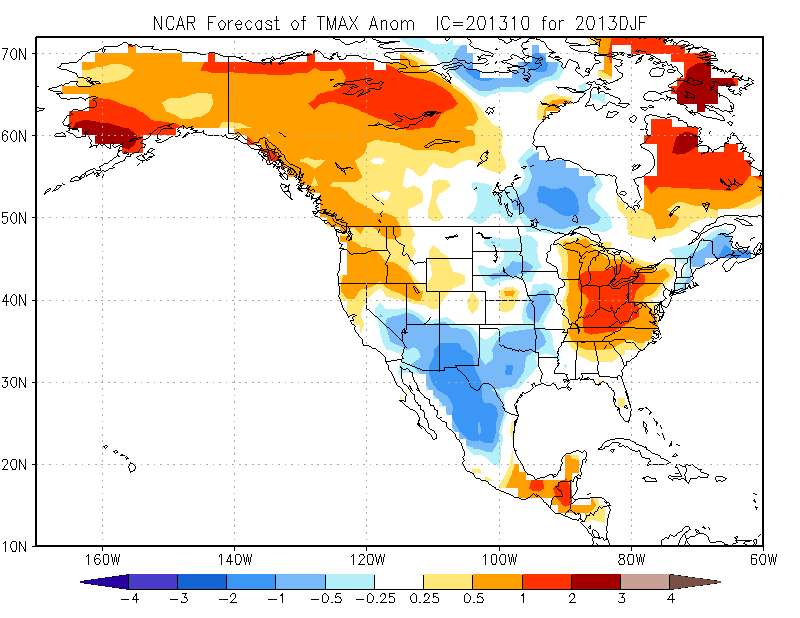 Winter outlooks for 2013-2014 as of Mid October. The first outlook is the U.S. National Weather Service’s Climate Prediction Center (CPC) outlook. This outlook focuses the greatest probability of warmth over an area from Louisiana to Arizona and from the Gulf and U.S./Mexico border north to the AZ/UT-NM/CO-KS/OK borders and then southeastwards through SW Arkansas and into Louisiana. A second warm area is forecast over northern New England. An increased probability of dryness is expected over an area centered over far west Texas and New Mexico and as far west as SE Arizona and as far east as the middle of Texas. A second area of dryness is placed over the southeastern states including Florida. The remainder of the country has equal chances for warmer/cooler or wetter/drier conditions. Signals are not strong enough in any way to tilt the odds one way or another. The warmth has been scaled back from the September outlook. In September, the local area was included in the area given a greater chance for above average temperatures. Several other models used in making these predictions have switched over to cold signals in the past month for our area. The intensity of the shading does not indicate how much warmer and drier these areas will be, but rather how confident that the forecast of warmth and dryness will verify. THE NWS CPC verdict: Near average or no strong signals either way. This is the NWS Climate Prediction Center’s temperature and precipitation forecast for meteorological winter (Dec 2013-Feb 2014) which indicates no strong signals for warmer/colder or wetter/drier conditions locally. Last month’s outlook had indicated a slight tilt toward warmer than average temperatures. This has been removed in this current outlook. In their discussion issued October 17th, they indicated this was due to conflicting signals between colder weather as shown by European and international models and warm signals still forecast by U.S. and Canadian Models. These colder signals were not present last month. The CPC will update their winter outlook one more time, Thursday, November 14th. One of the models used in the above forecast is the Climate Forecast System’s Version 2 model, (CFSv2). This model’s most recent run expects temperatures to average nearly 2 degrees F above average over the region this winter. This model has been persistently warm over the past year. The CFSv2 verdict: Warmer than average and wetter than average. This is the latest run of the NWS Climate Forecast System’s Version 2 model, (CFSv2). It favors above average temperatures over the region. Here is that model’s forecast for winter precipitation. It forecasts above average precipitation. This is the latest run of the NWS Climate Forecast System’s Version 2 model, (CFSv2). It favors above average precipitation over the region. 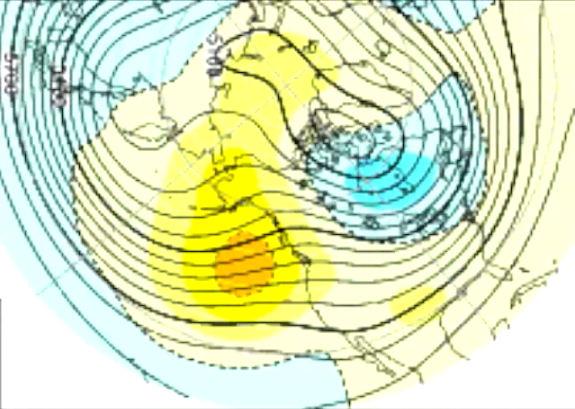 This model is the Japanese Meteorological Agency’s (JMA) model of the prevailing upper air pattern for winter. It forecasts a high pressure ridge over Alaska and NW Canada to off the U.S. west coast and a low pressure area over Hudson’s Bay. The colors represent upper height departures from average and not specific surface temperatures. 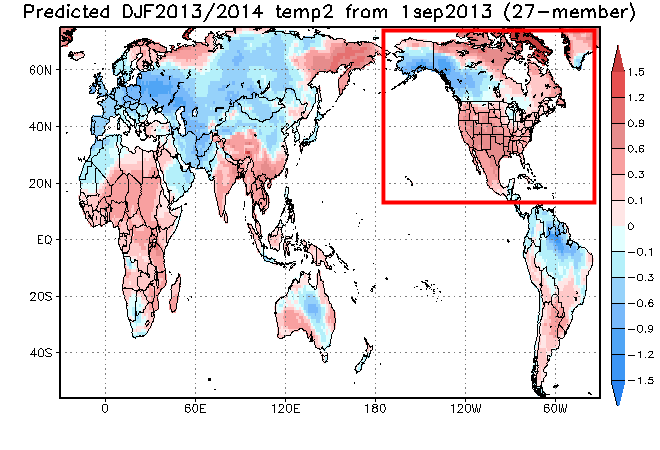 This type of pattern would favor cold for the central and eastern U.S. and warmth out west. It does indicate an occasionally active southern jet stream which could act to bring rain and or snow to some areas. This is overall a drier pattern for the region but one in which significant snows could occur given the right setups. It would also favor an increased chance for Arctic outbreaks due to cross polar flow. The prevailing pattern would be a positive Pacific North American (+PNA) pattern. The JMA’s verdict: Colder and drier overall but increased potential for Arctic outbreaks and snow. This is the Japanese Meteorological Agency’s (JMA) upper air forecast for Meteorological Winter (December 2013-February 2014) . It forecasts a high pressure ridge over Alaska and NW North America and a low near Hudson’s Bay. This is a cold forecast for the central and eastern U.S. for most of the winter. A southern stream split flow is also shown which would increase the risk for cold air mass-skirting winter storms. A private forecasting company called AccuWeather issues a specific winter forecast each year. Here is the latest current forecast as well as the past two years. Also shown is how these verified for our local area. This blog does not endorse AccuWeather’s forecast nor dismiss it, these panels are shown for information only. AccuWeather owns the rights to their forecasts. AccuWeather’s verdict: Snow and Ice for Kansas City with above average snowfall for the season and severe thunderstorms for St. Louis, SE Missouri and S Illinois and near average snow. A private weather organization called AccuWeather is famous for its much anticipated winter outlooks. Shown here are the current and last two winter outlooks. Please note: this blog does not endorse or dismiss their forecasts, they are simply shown for informational purposes. For 2012-13, the forecast for above average temperatures verified, but the below average snow prediction did not. For 2011-12 neither the temperature or snowfall forecast verified. The next winter forecast is from the International Research Institute (IRI) which runs a number of differing climate forecasting models to come up with a winter outlook. IRI verdict: Near average or no strong signals either way. 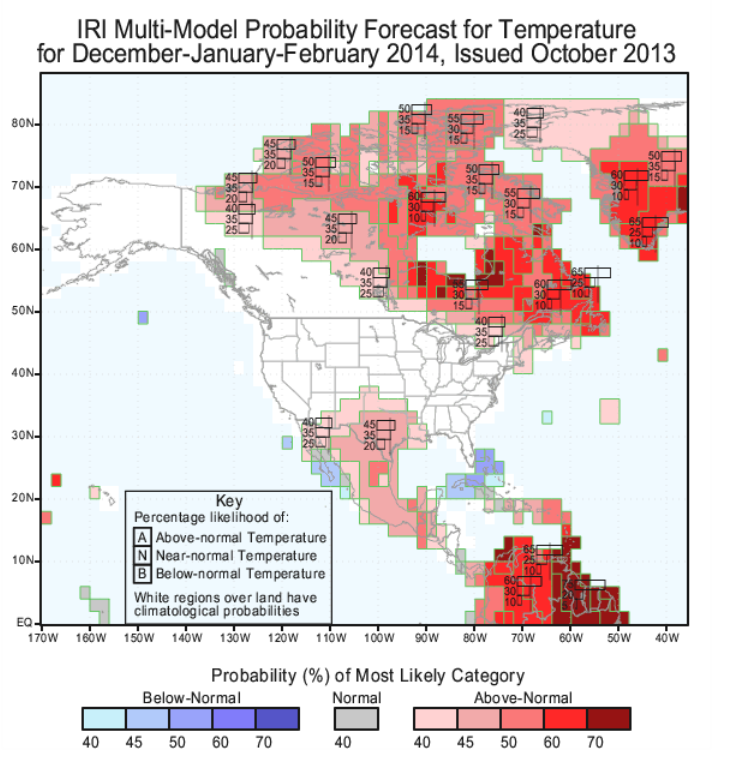 This is the IRI (International Research Institute) multi-model forecast for winter temperatures. It calls for greatest probability of above average temperatures over northern and eastern Canada, New England (north) and the southern Plains and Mexico (excluing Baja California). Over the US, it closely mirrors the CPC outlook. 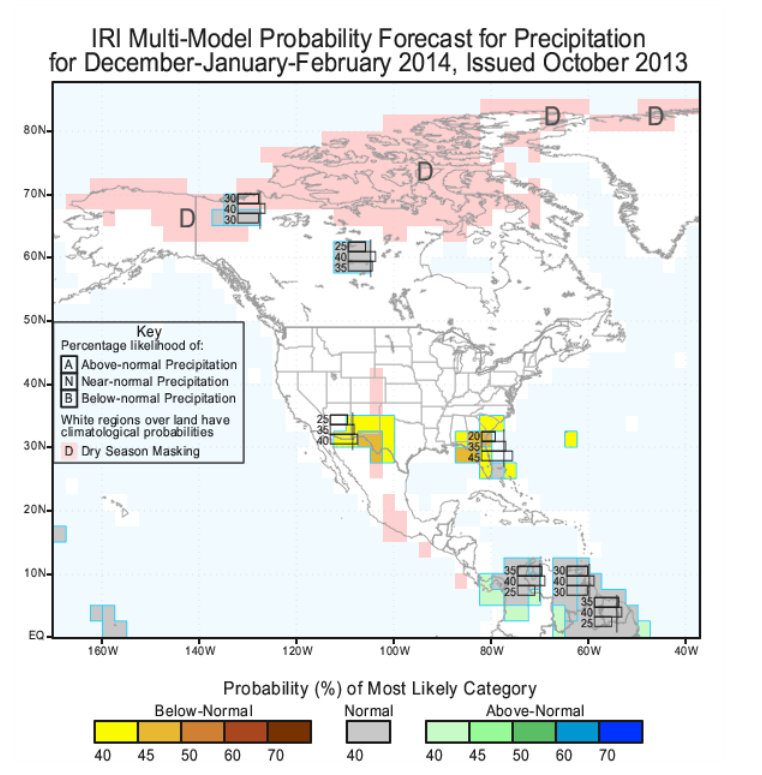 This is the IRI (International Research Institute) multi-model forecast for winter precipitation. Dryness has an increased chance over the southern Plains and Southeast. 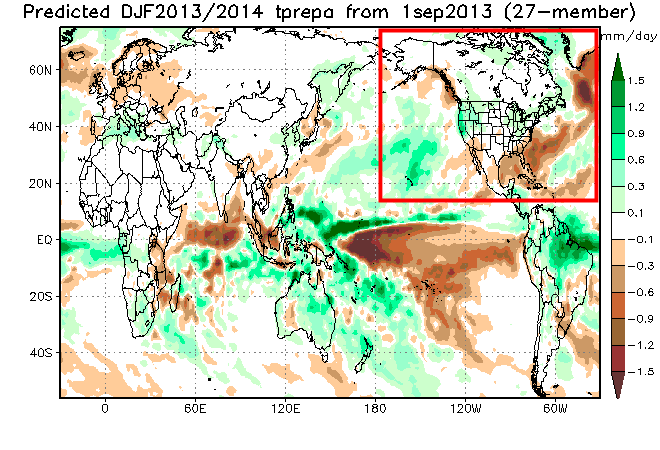 The pink areas are regions where a dry season occurs in this period. The next outlook comes from us from Japan, the JAMSTEC (Japan Agency for Marine-Earth Science and Technology) long range climate model. Their latest forecast is a bit dated, from September 1st. JAMSTEC verdict: Warmer than average with near average precipitation. This is the JAMSTEC (Japan Agency for Marine-Earth Science and Technology ) temperature outlook for winter issued September 1st (the latest available) It forecasts a warm winter for most of the continental U.S. except for the western Great Lakes. NMME (National Multi-Model Ensemble) verdict: Warmer than average temperatures and no strong signal for precipitation. The NMME (National Multi-Model Ensemble) forecasts an enhanced probability of above average temperatures and no strong signal for precipitation. NCAR (The National Center for Atmospheric Research) verdict: Cooler than average west and warmer than average east. No precipitation forecast is available. NCAR (The National Center for Atmospheric Research) expects cooler than average weather west and warmer than average weather east. 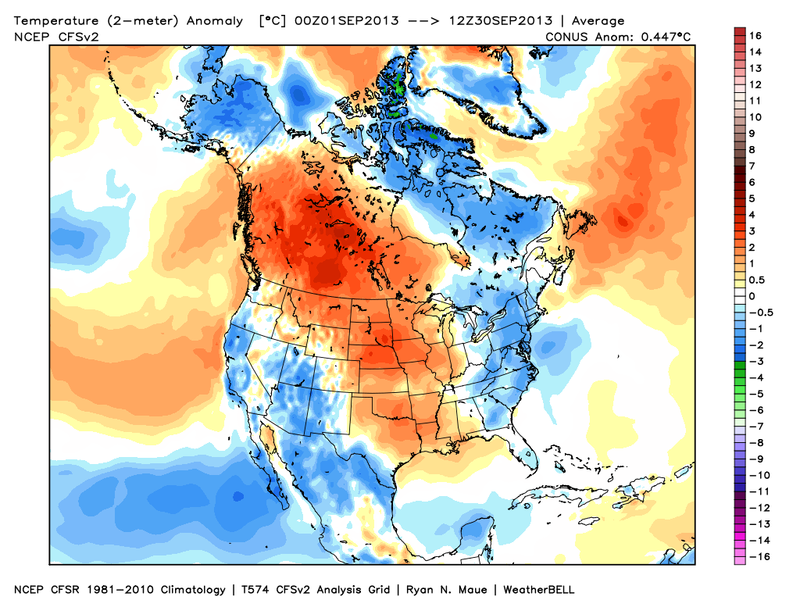 The Canadian Meteorological Center’s verdict: Warmer and drier than average. The Canadian Meteorological Center’s forecast results in warmer and drier than average conditions. The US Navy model’s verdict: Slightly warmer and slightly drier than average. 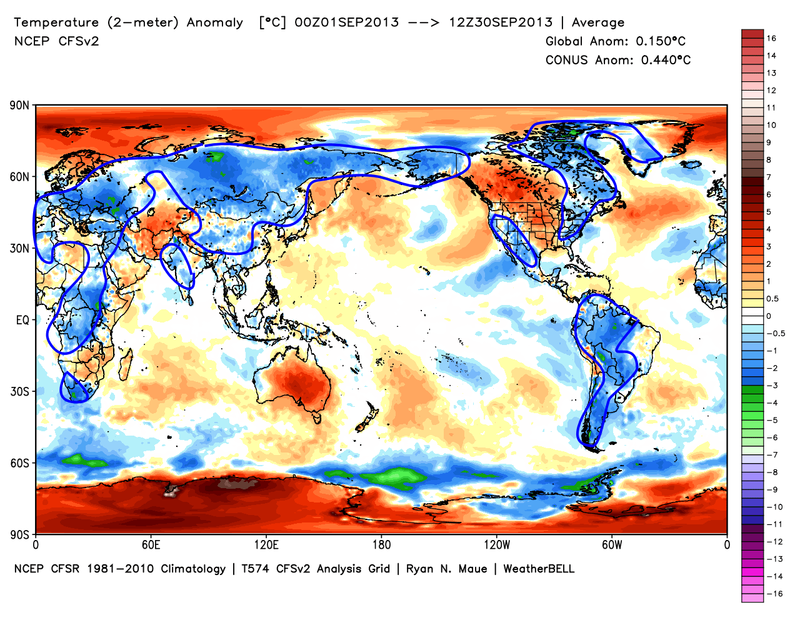 The U.S. Navy’s GFDL model expects slightly above average temperatures and slightly below average precipitation. A private forecasting company called WeatherBell issues a winter forecast each year. Forecasts are based upon a comprehensive detailed meteorological analysis of many different global models, sea surface temperature, temperature of the stratosphere and solar cycles. Here is the latest current forecast. Over the past few years, Weatherbell’s forecasts have verified quite well for our area. This blog does not endorse Weather Bell’s forecast nor dismiss it, these panels are shown for information only. Weatherbell owns the rights to their forecasts. WeatherBell’s verdict: Colder and snowier than average. WeatherBell, an independent private forecasting agency forecasts below average temperatures by 1-2 degrees C over the region and 133% of average snowfall. 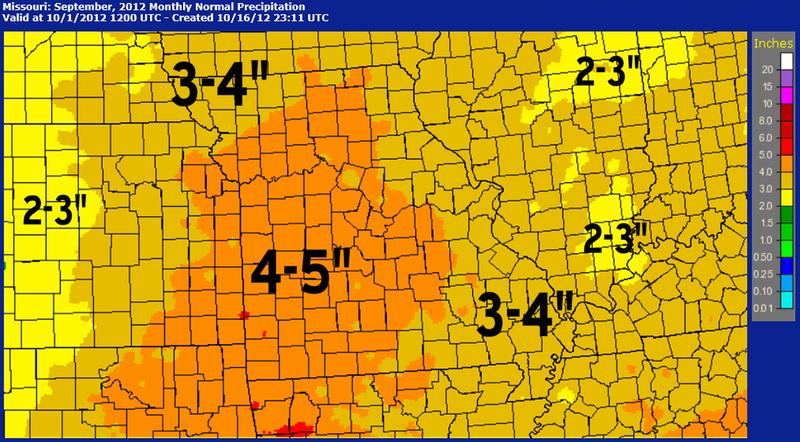 That would amount to roughly 25″ in Kansas City, 23″ in St. Louis and 7-15″ for SE Missouri and Southern Illinois. Note: WeatherBell owns the right to its winter forecast and this graphic neither supports nor dismisses its claim. Here is a simplified scorecard of all the differing forecasts presented here. Cold and snowy is in first place with three votes, followed by warm with 2 votes, then near average and warm and dry with 2 votes. warm and wet and cold round out the last two categories. NCAR is split in to halves, one cold vote for the west and one warm vote for the east. 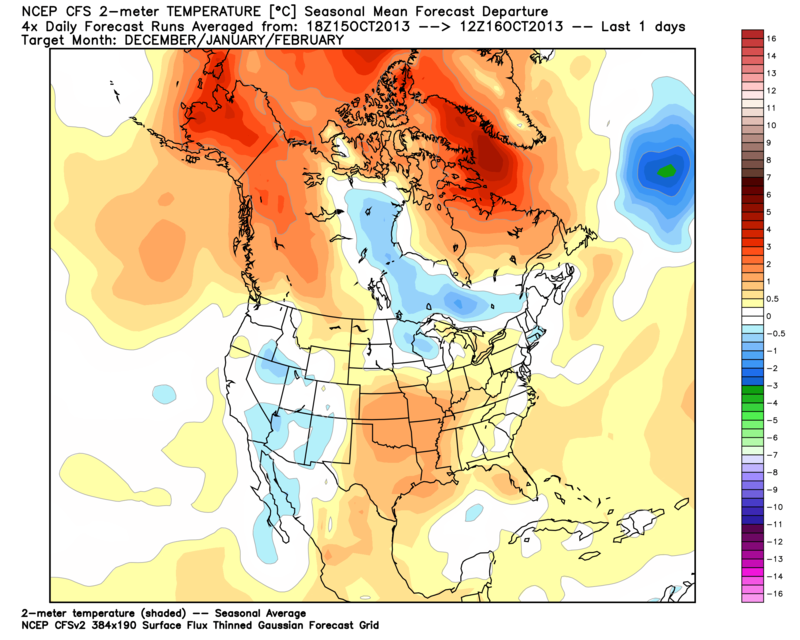 Winter outlooks will be updated; and this post will be updated in mid to late November. September goes down in the record books as above average as the warm pattern started in mid August continued and neared 45 days in length. Rainfall was near average, ranging from slightly above in Kansas City to slightly below in St. Louis. September marks the transition into the cool season. 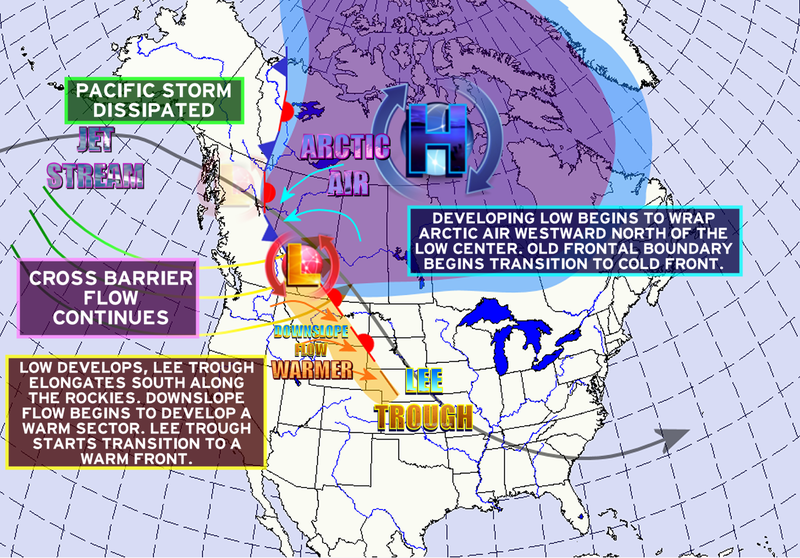 Weather systems begin tracking further to the south into the central U.S. and rainfall transitions from the thunderstorm clusters of summer to the larger and more organized storm systems and cold fronts of the cool season. Although hot weather can continue well into the month and both cities have recorded temperatures in the 100s on numerous occasions, cool outbreaks begin to be felt more frequently. Frost in September is rare, as the growing season typically lasts into the third week of October. Daylight begins a sharp decrease and 1 hour and 13 minutes are lost from September 1 to September 30th. The graphic below shows the changes in daylight on the 21st of each month. Note the rapid decline from August 21 to September 21. Click on the image to make it more readable. This is a plot of the length of daylight over a period of 14 months and shows the length of the day on the 21st of each month. The 21st is used as that is near the date of the Spring and Fall Equinox and the Summer and Winter Solstice. In Kansas City: The average high was 83.1, 4.1 degrees above average. The average low 59.9 was 2.6 degrees above average. The overall temperature was 71.5 which was 3.3 degrees above average. Kansas City’s highest temperature was 100 on the 8th, which was also the highest temperature of the year. Kansas City’s downtown airport reached 102. The coldest reading was 46 degrees on the 29th. There were 8 days when temperatures reached 90 or higher and 1 date at 100. In St. Louis: The average high was 84.3, 4.1 degrees above average. The average low 63.5 was 2.9 degrees above average. The overall temperature was 73.9 which was 3.5 degrees above average. The highest temperature was 99 on the 9th. The coldest reading was 51 degrees on the 22nd. There were 6 days when temperatures reached 90 or higher. The charts below show the month’s temperature trends with respect to above or below average. For both cities a majority of the month was warm with just a few cool days interspersed. The warmest period with respect to average was in the opening days of the month with near record heat. Daily temperature plot for Kansas City and St. Louis showing daily temperatures above or below average. Taking a wider look at the North American continent, warmth stands out over central and western Canada where it is strongest, and extends southward through the center of the U.S. Monsoon clouds and rain contributed to cooling over the Desert Southwest and elsewhere Alaska through northern and eastern Canada and the eastern U.S were also on the cool side. Our warmth is the exception compared to the rest of the globe (except the polar areas) Across the northern hemisphere, the warmth over parts of North America really stands out. Aside from smaller areas of the Middle East and west central Russia, a majority of the hemisphere has experienced a cool month (blue shading). We’ve been alternating extended periods of cool vs warm over the past year. Those periods were 100-120 days from mid Fall 2012 to early Summer 2013 but have shortened since. Temperature trends for the last 365 days are shown here. There have been extended periods of alternating warmth and chill. Since June, these alternating periods have grown shorter. The Climate Prediction Center’s September forecast issued in mid August indicated an equal chance for above, near or below average temperatures for September. Rainfall for September was slightly above average in Kansas City and slightly below average in St. Louis. Torrential rains on September 19th in Kansas City dumped 2.58″ of rain which was a record for that date. Flooding was reported in several areas of the city with a band of strong to severe thunderstorms . That band of storms made all the difference. 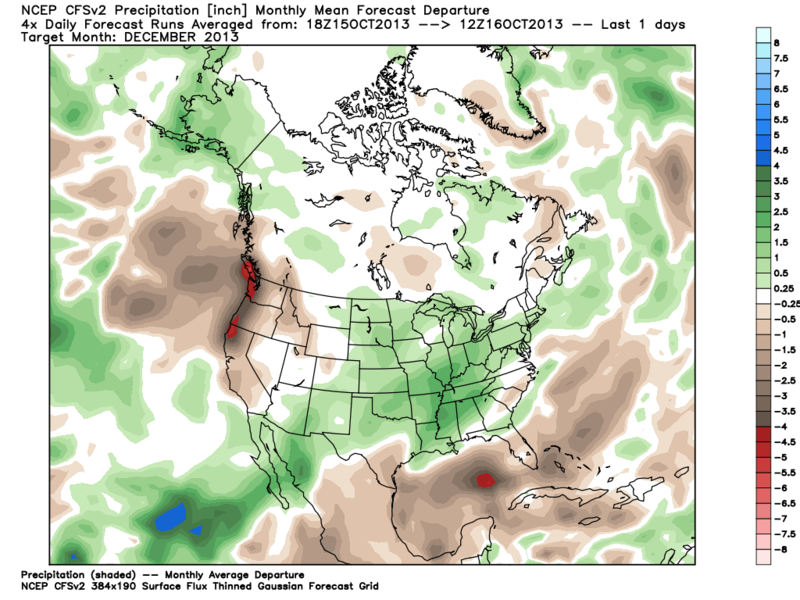 Take away the rain from that one event and September would have finished 2.36″ below average. September is now the first month in Kansas City with above average rain since May and is now only the 5th month in the last 21 to record above average precipitation. The 2.58″ of rain observed was also the most rain at one time observed since 3.15″ fell on August 17, 2009, 4 years 1 month and 2 days prior. Average rainfall in September ranges from 4 to 5″ over central and western Missouri, and 3-4″ over NW, SE and Eastern Missouri and southern Illinois. A few areas of 2-3″ rains are found in central and southeastern Illinois. 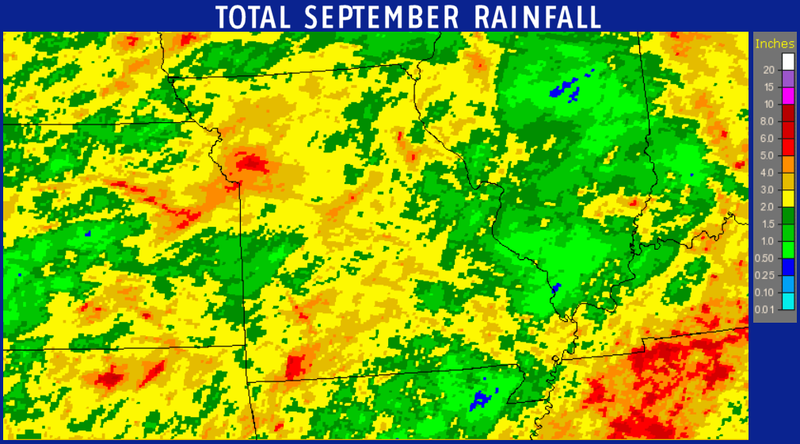 The chart below shows average September rain over S Illinois, Missouri and E Kansas. Average September rainfall across eastern Kansas, Missouri and southern Illinois. Rainfall totaled 4.84″ which was 0.22″ above average in Kansas City. In St. Louis, rainfall totaled 2.74″ which was 0.39″ below average. The charts below show the 30-day rainfall trends at Kansas City and St. Louis. Both cities experienced long periods without significant rain. The map below is a combination of radar and surface observations of September’s rain across eastern Kansas, Missouri and Southern Illinois. What immediately stands out are the light green colors centered over S Illinois and adjacent SE Missouri. These represent widespread monthly rain totals of between a half an inch and 1″ which has contributed to developing dryness and drought in this area. The blue speck NE of Cape Girardeau represents an area of Union County, Illinois which only received a quarter to half an inch of rain all month. The heavy rains of September 19th show up nicely around Kansas City in the reds, representing small areas of 5″ monthly rain totals. Observed and radar estimated September rainfall totals. This map compares observed rain with average September rain. The yellow colors represent a deficit with greens a surplus. Grey colors show areas that were within a half inch of average. 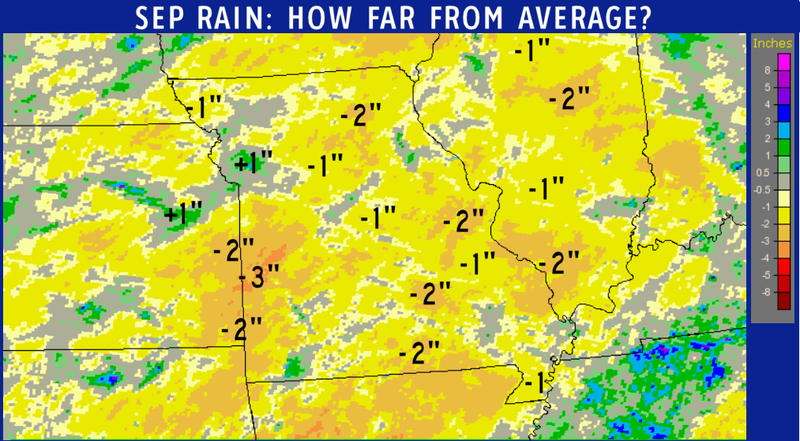 Most of the region had sub-par rains in September, with the exceptions over Kansas City and just NW and SW, a small area of NE Missouri and a small area of SW Missouri. September rain difference from the 1981-2010 monthly average. The NWS Climate Prediction Center’s September Outlook issued in mid August had called for above average rainfall for eastern Missouri and Illinois (low confidence) which was adjusted to equal chances for above/near/below average on the update issued August 31st, Equal chances for above/near/below average was predicted for the Kansas City area in the mid August forecast and in the end of the month update. Fog and low clouds have surged northward again last night and will make for a rather grey start to Tuesday in many areas of the region. The worst fog is down across the Missouri Ozarks. The fog will lift into an area of low clouds by mid to late morning with those clouds scattering out in western areas by noon. Eastern areas can expect clouds to linger a good part of the day. A weak Pacific front has stalled just northwest of the area; this is the front which moved onshore in Washington and the Pacific NW Sunday night with the high winds and heavy rains. All that remains now is a weak and dry boundary. Southerly winds on the south side of the front will keep warm air surging northward into the region today with highs in the 80s. The only areas that will be cooler are those areas which remain locked in with clouds most of the day. Upper 70s expected in these areas. Tuesday’s weather and high temperatures. The front will lift back northward tonight as another round of fog and low clouds roll northward from the mid south.